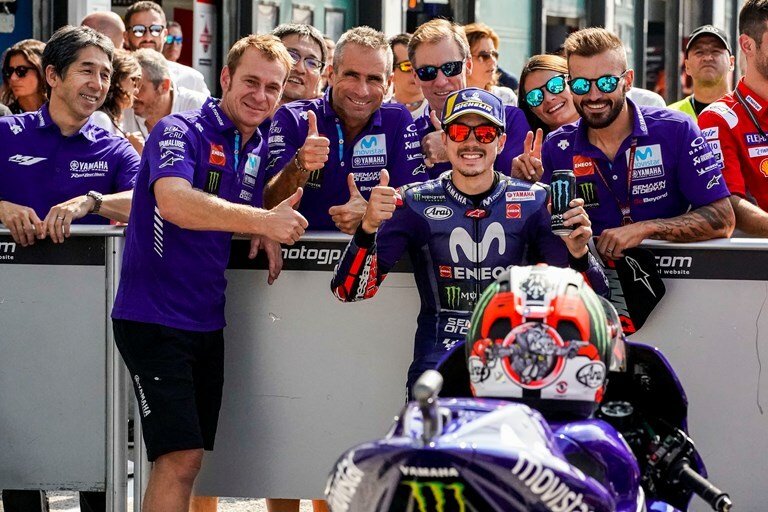 Movistar Yamaha MotoGP’s Maverick Viñales saved his best effort for last in today’s 15-minute Q2 shoot-out to secure third place on the starting grid for tomorrow’s Gran Premio Octo di San Marino e della Riviera di Rimini. Teammate Valentino Rossi was looking competitive in the early stages of Q2, holding on to a second-row start, but ended the session in seventh place. In challenging conditions Monster YamahaTech3’s Johann Zarco showed his incredible talent at the Misano World Circuit Marco Simoncelli this morning by taking over the top with his last flying lap and lowering his best lap from Friday to make it directly to Q2. He concluded the all-important Qualifying just 0.621 seconds behind the new pole position record. In the meantime, Hafizh Syahrin did some great steps in today’s FP3, imroving on his FP1 time by incredible 1.786 seconds, but struggled to find his strong feeling again during the short Q1 session in the afternoon and has to tackle his 12thever MotoGP race at 14.00 local time on Sunday from the ninth row of the grid.